Whatever you may call it, or know it as, all the above names come to describe the same thing. We Now Offer High Quality Photo Scanning! We call it a Photo Montage. This is where we take pictures, slides, music and titles and combine them all into a truly unique video presentation. Our photo montages are so cool! You gotta love them. It’s time to start pulling out all those old photos that you haven’t even looked at in years. Heck, you didn’t even remember you had some of those real “Classics”. Come up with some of your favorite old songs and you’re on your way to something special. These make the most Awesome gift ever! We have been doing video photo montages for our customers for years. We offer many different services here at “Document It” On Video. Without a doubt, our greatest is our photo montage. We get calls and letters from very happy customers on a regular basis after they’ve viewed their totally custom montage. Our video photo montages can be quite emotional, and really tug at your heart. We’ve done these for many special occasions. Wedding anniversaries, birthdays, graduations, retirements, wedding receptions, family history, sports team, new baby, vacations and memorials. Let us do one for your special occasion. All of our montages are custom made for each individual customer. You let us know what your looking for. Giving one of our custom photo montages to a loved one or friend truly is “The Perfect Gift”. It will be one gift they will cherish forever! We are located about a mile east of the 5 FWY at the Oceanside Blvd. exit right here in Oceanside, CA 92054. If you live in Carlsbad, Vista, Encinitas, San Marcos, Camp Pendleton, Rancho Santa Fe, Solana Beach, Del Mar and all North County you are a short drive away. Please give me a call with any questions you may have. Thanks! 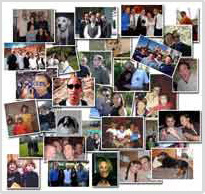 but our most popular service is our Custom Photo Montage. Let us put one together for your next special occasion. It will be by far the hit of the party! See Sample. Do you have some classic record albums and/or audio cassettes that you absolutely love, and totally remind you of the good 'ol days? But these gems have never been released on CD? Let us put your LPs & Audio Cassettes onto CDs. Copyright©2019 "Document It" On Video. All rights reserved.